IVR (Talk Professional or Enterprise): Create Interactive Voice Response (IVR) greetings. For details, see Routing incoming calls with IVR. Callback (Talk Professional and Enterprise): Prompts the caller to select a callback option (if callback is enabled). For details, see Allowing customers to request a callback. Callback confirmation (Talk Professional and Enterprise): Confirms the caller's callback request (if callback is enabled). For details, see Allowing customers to request a callback. You can either use the default greetings (available in English or Japanese) or create your own custom greetings. You can create as many greetings as you want, and associate different greetings with each of your Talk phone numbers. This enables you to offer a branded or localized experience for each phone number. If you prefer to use your own custom greetings, you can record new messages right from your browser or you can upload an existing MP3 or WAV audio file with a maximum file size of 10 MB. For Wait greetings, we recommend a length of about 10-15 seconds. Note: Audio files that include album art are not supported. A list of your greetings in each category are displayed. You can show only the category you want by using the drop-down filter. Click Add greeting in the upper-right corner. On the add greeting page, enter a name for your greeting and select the greeting type. Upload greeting Select and upload an MP3 or WAV audio file. The maximum file size is 10 MB. After you upload the audio file a play button appears that you can use to preview how your greeting will sound. Audio files that contain album art are not supported. Record greeting Immediately begins to record audio from the device's active audio input device. Press stop once you finish talking. A play button appears that you can use to preview how your greeting will sound. Delete greeting This icon appears when you have uploaded an audio file, or recorded a greeting. The current greeting audio is deleted. From the list of Associated numbers, toggle on the numbers you'd like to associate with your new greeting. Tip: You can also type part of a number, or name in the search box to find the numbers you want. Your new greeting is displayed on the Greetings tab of the Talk settings page. 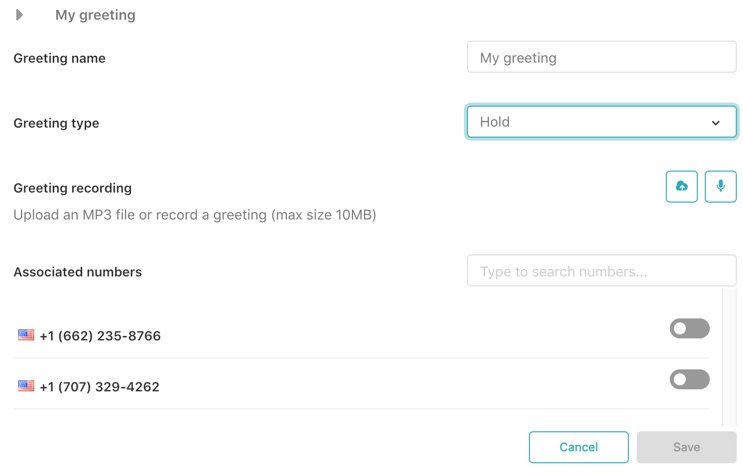 An alternative way you can associate numbers with greetings is from the Numbers tab of the Talk setting page. For each number, you can set a wait greeting, available agents greeting, hold greeting, voicemail greeting, and callback greeting. Next to the number you want to add a greeting for, click the menu icon ( ), then choose Edit. In the Voicemail tab, select a voicemail greeting. Talk Professional and Enterprise: In the Callback tab, choose a Callback greeting and Callback confirmation greeting. Tip: Looking for some great hold music to use? Check out the winner of our hold music contest, and download it for free. We are just setting up Voice for our customer service team and I'm not sure how the call flows work. When agents aren't available what happens? Is there a message for that? Our current phone system has an out of hours message that directs the call to our voicemail. Just unclear how to script the messages when I cant see anything that shows how the calls are routed. Hi Intis, thanks for your comment! In Zendesk Voice, If no agents are available, the call is routed to voicemail, just as in your current system. Hope that help! So no intro message to say agents are unavailable? As in, you call and just get played the voicemail message right away? So for example can we do the following? In the case option 1 the caller reaches an agent over the phone (if within business hours/agent available/logged in), in the case of options 2, 3 and 4 the caller doesn't reach an agent, but gets a repeating message that details how to reach our Knowledge Base and submit a support ticket online. The article configuring voicemail options may have some helpful info for you. If you're on the Professional or Enterprise plan, you can route incoming calls via IVR. This will allow you to create a menu with options callers can choose through keypresses. You can build a simple phone tree with one level or, if you have a complex support team structure, layer multiple menu levels together. Check those out and let us know if that helps or if you have additional questions. I want to change our available agents greeting for a custom message. I have recorded and saved this and it shows as the set greeting but when I call to check I am still played the default greeting? Can you give us more detail about exactly how you have everything set up? It would be great to have the option to upload different greetings for holidays which are set up in the schedule than the standard "Outside schedule" Voicemail. Currently the only way is to upload the desired greeting before the holiday and re-upload the standard greeting afterwards again. This can be very tiring and is error prone if you have multiple schedules and country/language lines. \Edit: I have created a product feedback regarding that - feel free to upvote! Thanks for that feedback! I encourage you to post it in the Product Feedback topic, which the Product Managers read through on a regular basis. Is it possible to have no greeting on a number so that it goes straight to ringing? Just to clarify, do you mean that you want to bypass the IVR completely and just have the call ring to the first available agent, as if it were a regular phone? Jessie - Yes. For one of the phone numbers, I'd like it to bypass the IVR and ring the agent it is assigned to. If you are wanting calls to this number to be queued immediately, without hearing any greetings, you would navigate to Admin (gear icon)> Channels> Talk> click the 'Numbers' tab> choose the number you want to modify. Here you will switch both Available agents greeting (voicemail on) and Available agents greeting (voicemail off) to 'None'. With these settings disabled, the end-user will be queued and presented with the audio file uploaded for the 'Wait' music/greeting. If no agents are marked as online, they'll be immediately sent to your voicemail if enabled. I hope this gets you in the right direction! Is it possible to somehow give teamleaders access to change the greetings? The Team Leader custom role has greater access than agents, but it currently does not include the ability to modify settings in your Zendesk Talk. Changing the greetings is still limited to the Admins of your account. Is there a way to assign different greetings based on business hours? 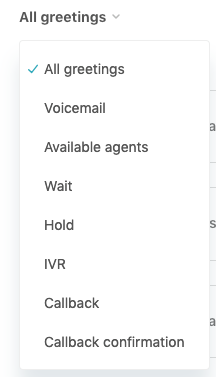 At this time it seems we can only have either available agent or voicemail so our voicemail message has to be "all agents are busy or it's after hours" and it would be really nice to separate the two. Why did you remove the phone call option for recordings? My talk is routed through to an office phone, not via browser, so how am I supposed to record anything using the "microphone permissions"? So frustrating.